The Dutch artist Guido van der Werve (Papendrecht, 1977) has built an oeuvre of short films in which Van der Werve himself stars. Some of his films show him performing actions in the tradition of the performance art of the 1970s. For 'Nummer acht' (2007), for example, the artist walked out in front of an icebreaker on a frozen arctic sea, and for 'Nummer negen' (2007), Van der Werve stood for exactly 24 hours on the geographic North Pole. Van der Werve portrays a typical Romantic hero in these works: the solitary figure tempting fate by physically subjecting himself to the whims of Nature, in order to experience an intensification of reality. In the current exhibition, Van der Werve’s latest, most ambitious film, 'Nummer twaalf' (2009), takes centre stage. This film revolves around three unsolvable ‘infinity questions’, which are dealt with in three separate scenes: the romantic King’s Gambit, a chess opening; tuning a piano; and counting the stars in the night sky. 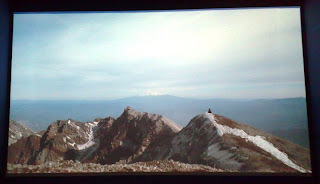 The artist filmed these scenes at three locations which symbolise these ‘grand’ subjects: the legendary Marshall Chess Club in Manhattan (where illustrious players like Bobby Fischer and Marcel Duchamp were once members), the active volcano Mount St. Helens in the north-western US and the San Andreas Fault in California. As in a number of earlier films, the ‘sublime landscape’ once again plays an important role in 'Nummer twaalf'. While classical music always had an emphatic presence in the earlier films, in 'Nummer twaalf', the artist has found an inventive way to integrate the music with the work itself. 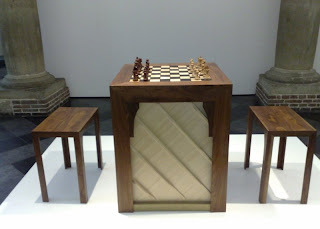 Basing himself on a personally developed transcription of chess notation into musical notation, Van der Werve constructed a unique ‘chess piano’. In this chess board on top of a piano mechanism, each of the 64 squares of the game board simultaneously serves as a piano key. The moves made during a game of chess are automatically turned into notes, resulting in a composition. As a result, the game of chess played by Van der Werve and a Grandmaster, which serves as one of the film’s leitmotivs, literally produces its own musical score. The artist seems to be looking for ways to ‘re-enchant’ the world – to effect minor, personal miracles that allow us to briefly escape our hum-drum everyday life and see the world with a fresh sense of wonder. As such he is a representative of a tendency in contemporary art, in which the artist – after a period of impersonal, analytical deconstruction of reality – once again explicitly becomes ‘author’ and the producer of personal and emotional experiences. Besides 'Nummer twaalf' and the chess piano, the exhibition includes two other films from the museum collection, 'Nummer vier' (2005) and 'Nummer zes' (2006), which have strong thematic and formal ties with 'Nummer twaalf'. These films also make use of long shots and slow camera movements, for instance, and music plays an important role. hello, good morning to all, I read his blog yesterday, comparing information, and reach the conclusion, that their information is very professional, I would love to have your blog update about Guido van der Werve-museum de Hallen Haarlem NL. Thanks for creating and sharing this information.! Especial Trip outdoors coaches for you to Gibralter, Rhonda such like. accommodation. LG' prices in about , Family theatres, wine bottle coolers, ACs, Mobile phone handsets, microwave ovens so the majority insignificant appliances for the home. Repair an improper. Own a problem, small or large, with a weight of in every thought?